If you are reading this post, it means the Neco result is out and you want to check yours. Neco result usually comes out by September. 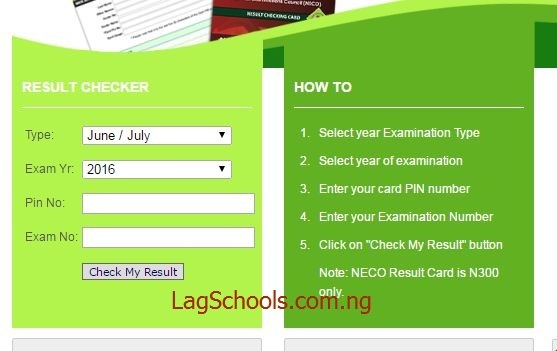 To check your Neco result you need to buy the NECO result scratch card. There is no way you can check your result without buying the NECO scratch card. Buy the NECO scratch card (You will need the pin). Visit the NECO result checker website www.mynecoexams.com/results. Select the year you wrote the exam. Enter the pin number from the scratch card. Click on check my result. Note: When selecting the exam year; choose June/July for the normal Neco, choose November/December for NECO G.C.E. For Junior Waec, choose JSCE and for NECO common entrance, choose NCEE. After checking your result, you are advised to print the result immediately. The pin on your scratch card allows you to check your result for a limited time. You are advised to print the result in colored form. You can buy the Neco scratch card from us or you can go to a NECO office that’s close to you. In a case where your location is far from a NECO office, the best option is to buy from us. When you buy the Neco scratch card from us, we will send the Neco pin to your mobile phone number, check the result for you and send the pdf copy of the result to your email address. This way, you can access your result anytime from your email address. NECO support emails: Support@mynecoexams.com, Neconigeria@yahoo.com. Are you sure you checked it properly? If problem persist, visit a NECO office to complain.